"Icebreaker" redirects here. For other uses, see Icebreaker License. 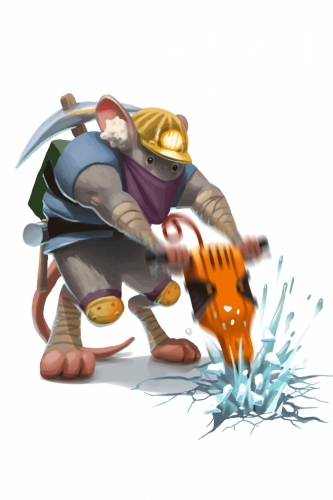 The Icebreaker Mouse is a breed of mouse found in the Slushy Shoreline and in the Treacherous Tunnels and Bombing Run zones of the Iceberg location. They are known to drop Wire Spool as loot in the Slushy Shoreline, and Hunting Research, Satchel of Gold, Sticky Charm and Wax Charm in the Iceberg. Icebreaker mice have no specific preference for any kind of cheese. The Icebreaker mouse can only be encountered in the Slushy Shoreline when a hunter has Softserve Charms armed. In the Iceberg, the encounter rate for Icebreaker mice can be increased by arming the Magnet base. The Icebreaker Mouse drops the Slushy Shoreline Egg during the annual Spring Egg Hunt. The Icebreaker was released on 14 May 2012. Icebreaker mice dropped Interlocking Hull Fragments between 14 May 2012 and 24 May 2012. They began to drop the loot in the Iceberg location on 1 June 2012.